With the report late Wednesday that a deal to evacuate the last of the Western-backed Islamist “rebels” from eastern Aleppo was back on track, following an earlier renewal of clashes, the scale of the debacle suffered by Washington in its five-year war for regime-change in Syria is emerging ever more clearly. The increasingly hysterical denunciations of the Syrian government and its allies, principally Russia and Iran, for alleged atrocities in the retaking of Aleppo is a measure of the disillusionment and bitterness within the ruling circles of the major imperialist powers, particularly the US, over this strategic reversal in the drive to overthrow the government of President Bashar al-Assad. The frenzied tenor of the public anti-Russian propaganda is matched by the intensity of the behind-the-scenes internal recriminations. With the fall of eastern Aleppo, the US-backed “rebels,” a collection of militias dominated by Al Qaeda-linked Islamists, have lost control of their last major urban center, effectively precluding the successful utilization of these proxy forces for the overthrow of the government in Damascus. Kirby called special attention to the speech delivered the day before to the United Nations Security Council by US Ambassador Samantha Power, Washington’s self-righteous standard-bearer of “human rights” imperialism and undisputed champion of moral hypocrisy. When it comes to shamelessness, lies and justifications, Ms. Power has no equal. As she delivered her blistering denunciation of Damascus and Moscow for attempting to take “every last square inch of Aleppo by force,” the US military, in alliance with the Iraqi army and various militias, was preparing to do the exact same thing in the ISIS-held Iraqi city of Mosul, little more than three hundred miles to the east. US air strikes in Iraq and Syria have killed and maimed thousands, and the assault on Mosul, with a far larger population than eastern Aleppo, is expected to kill thousands more, while displacing up to one million civilians. Even as Power made her speech to the Security Council, Washington continued to provide the weapons and logistical and intelligence support enabling its key Arab ally, the Saudi monarchy, to wage a pitiless war against the people of Yemen, the poorest nation of the Middle East. She has issued no words of condemnation as US bombs and missiles killed well over 11,000 civilians in the space of just twenty months, and while, as the aid agency Oxfam put it recently, the entire country is being “slowly starved to death” by a US-backed blockade. Not surprisingly, in her list of “events in world history that define modern evil,” Power omitted Gaza, Fallujah and the countless towns and cities from Iraq and Libya to Vietnam and Cambodia where US wars of aggression have claimed the lives of millions. The World Socialist Web Site recognizes the immense suffering of the people of Aleppo, the brutality of the methods employed by the Assad government and its Russian ally, and the horror to which many thousands have been subjected. But what is the ultimate source of this catastrophe? Ms. Power may speak at the UN as if she inhabits some moral Mount Olympus from which she watches with outrage the violent events in Syria, but the truth is that Washington’s hands are dripping in blood. The drama that has unfolded in Aleppo is ultimately the product of a massive regime-change operation mounted by US imperialism, with the CIA alone spending some $1 billion a year to arm, supply, train and even pay the salaries of anti-government Islamist militias. This has been accompanied by crippling sanctions aimed at crashing what remains of Syria’s economy, combined with US air strikes. The reality underlying this “dream” was the rule over eastern Aleppo by a collection of Islamist militias that combined vicious sectarianism with gangsterism. Before it was pummeled into rubble by air strikes, the city was looted by these militias, which stripped factories of their machinery and supplies, transporting them across the border to Turkey to sell for a profit. 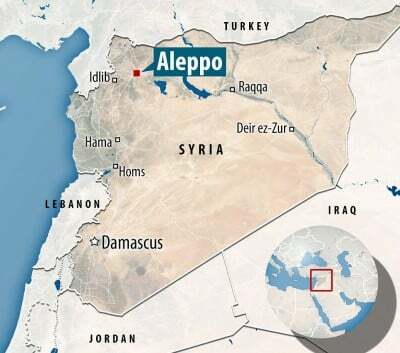 It adds, “In Aleppo and Idlib today, armed groups have free rein to commit war crimes and other violations of international humanitarian law with impunity.” The report documents summary executions and torture, while the “rebels” themselves have recorded and boasted of their crimes, including the beheading of children. If the Syrian government has enjoyed military success in Aleppo and elsewhere in the country, it is due not just to Russian firepower. After over five years of the US waging war for regime-change using these Al Qaeda-linked militias as its proxies, many Syrians see the Assad government, despite its repression and corruption, as a lesser evil. The hysteria within the media and the US political establishment over the fall of eastern Aleppo is driven to no small degree by the bitter internecine struggles over US policy toward Russia in the run-up to the inauguration of Donald Trump. In the course of the election campaign, Trump suggested that the US could ally itself with Russia in combating “terrorism” in Syria and questioned Washington’s policy of arming Syrian “rebels.” Powerful sections of the US military and intelligence apparatus are deeply opposed to any letup in the military drive against Russia. Anyone believing that Trump’s incoherent statements will translate into a new era of peace in the Middle East is in for a rude surprise. The Republican president-elect has advanced a policy of economic nationalism that leads inevitably to war, and has demanded a massive buildup of the US military to prepare for it. Such raving militarism is a warning that a Trump presidency will entail a further escalation in capitalism’s drive toward world war.